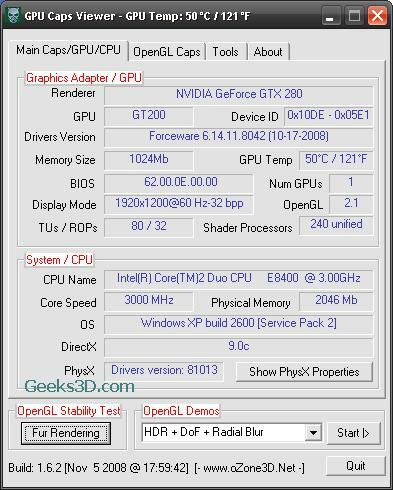 This new version of GPU Caps Viewer fixes a small bug in online submission (this feature has been accidentally disabled in version 1.6.0) and adds the detection of Radeon HD 4850 X2. Some dialog boxes (OpenGL extensions and XML report) have been resized to fit the screen of some ultra laptops like the eeePC (1024×600). New: added Radeon HD 4850 X2 to ZoomGPU database. Change: OpenGL extensions and XML report dialog boxes have been resized to fit the screen of some ultra laptops like the eeePC <1024x600).